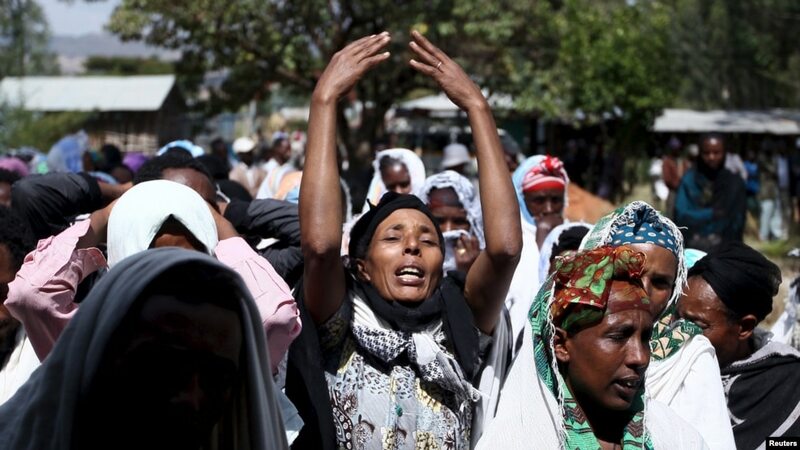 FILE – Women mourn during the funeral ceremony of Dinka Chala, a primary school teacher who family members said was shot dead by military forces during a recent demonstration, in Holonkomi town, in Oromia region of Ethiopia, Dec. 17, 2015. BRUSSELS — It is now one year since persistent, sometimes violent anti-government protests started in Ethiopia’s Oromia region. How much closer are the Oromos, Ethiopia’s largest ethnic group, to achieving their demands for more political freedom and economic inclusiveness? Opposition activists addressed members of the European Parliament this week in Brussels. Olympic runner Feyisa Lilesa is the most famous supporter of the protests in his native Ethiopia. Feyisa, the silver medalist in this year’s men’s marathon in Rio, drew attention when he crossed his wrists at the finish line, a gesture to show solidarity with the protesters. 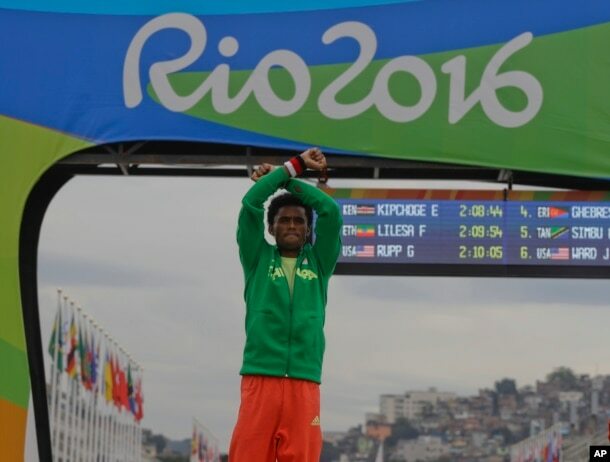 Silver medalist Ethiopia’s Feyisa Lilesa, crosses his arms as he celebrates on the podium after the men’s marathon at the 2016 Summer Olympics in Rio de Janeiro, Brazil, Sunday, Aug. 21, 2016. He said it will be disastrous if the current situation continues, adding that because all media is blocked in Ethiopia, he is using his visibility to get worldwide media attention by being a voice for his people. Also at the European Parliament is Berhanu Nega, leader of the anti-government diaspora group Ginbot 7. He was sentenced to death in absentia and labeled a terrorist by the Ethiopian government for trying to overthrow the government. Berhanu believes the next six months will show which direction Ethiopia is heading. He says international pressure is needed to prevent the current tension from escalating. “My hope is that at least some of the friends of this regime to talk sense that the path to power through violence in Ethiopia is over. That there must be a way to find an alternative and this alternative, to some kind of a soft landing, must happen quickly before it is too late,” he said. Demonstrations in the Oromia region started on November 12, 2015 in the town of Ginchi, about 80 kilometers west of Addis Ababa. Students and farmers protested a plan to enlarge the boundaries of the capital city. 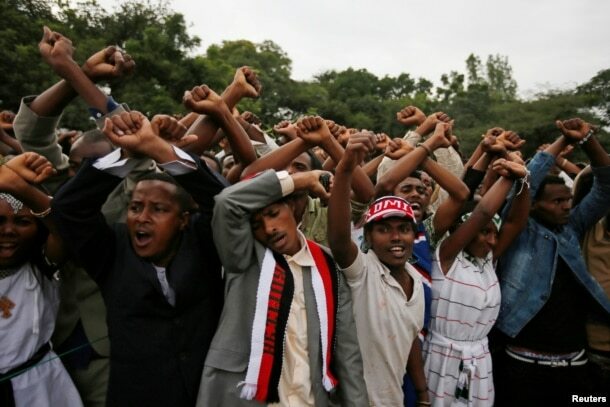 FILE – Demonstrators protest gesture during Irreecha, the thanksgiving festival of the Oromo people, in Bishoftu town, Oromia region, Ethiopia. More than 50 people were killed in the violence. Protests continued and spread through the country as demands were no longer only about land grabs but also about ethnic marginalization, political freedom and economic development. Hundreds of Oromo citizens have died, thousands have been imprisoned, and a six-month state of emergency was declared in Ethiopia last month. Oromo opposition leader Mulatu Gemechu of the Oromo Federal Congress says that despite a Cabinet reshuffle, a lasting solution is still far away. “Unless the government comes down to the table and discuss with the opposition parties and the other people who are not happy with the sitting government, and create peaceful dialogue, it is impossible to talk about the improvement of peace and all these things,” said Mulatu. 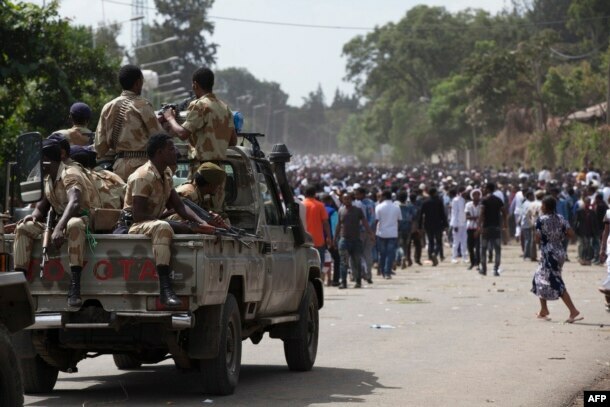 Professor Jan Abbink of the Center of African Studies at Leiden University says the Ethiopian government should not rely solely on the state of emergency to restore order. FILE – Oromo regional police officers wait in a pick up car during the Oromo new year holiday Irreechaa in Bishoftu, Ethiopia, Oct. 2, 2016.